The May-apple is a small perennial herb with long rootstalks or underground stems, a native of the United States and Canada, growing in rather moist woodlands. The entire plant attains a height of about twelve inches. The leaves are large, peltate (from pelta, small shield), margin deeply cleft, from five to nine lobed, lobes pendant, thus giving the leaf a semblance to an umbrella. It is remarkable that the flowerless plants have only one leaf, while the flowering specimens always have two, which are opposite upon the stem apex, carrying the flower in the bifurcation as shown in the illustration. Each plant bears a single flower upon a drooping stalk. The calyx consists of six greenish sepals, which, however, drop off as soon as the flower begins to unfold. The corolla consists of six or nine petals, which are quite large, thick, and pulpy, and of a creamy-white color. Authorities seem to differ as to the odor of the flower. Some speak of it as very fragrant; others designate it as nauseous, and others express no opinion. 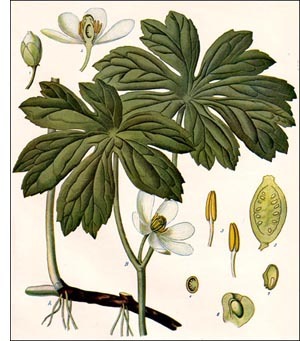 It is an undoubted fact that the rhizomes, stems, and leaves have a very heavy, nauseous odor, and it is not unreasonable to assume that this odor is traceable in flower and unripe fruit. The flowers expand in May and the fruit ripens in August. The fruit is a berry about the size of a plum. At first green, it changes to a soft yellow at maturity. It is not unlike a tomato in general appearance. When fully ripe it has a fragrant odor and tastes somewhat like the paw-paw. The principal use of the American mandrake is medicinal. It is a very efficient cathartic.